BoardSource recently released their latest report, “Leading With Intent: A National Index of Nonprofit Board Practices”. 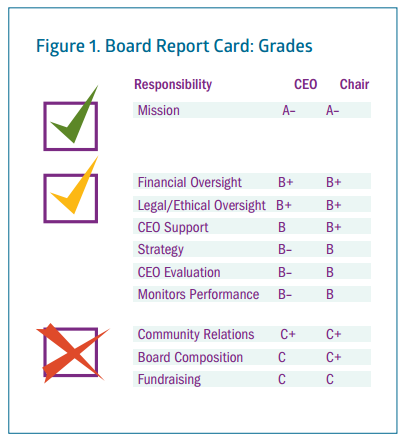 The report takes a close look at responses from a survey designed to investigate nonprofit boards and how they function. Leading With Intent is one of the most comprehensive surveys of its kind, with 846 nonprofit Chief Executives completing a lengthy survey (81 questions) grading various functions of a typical board. In addition, the Chief Executives were asked to share contact information of their Board Chairs, so an additional questionnaire could be sent out, with 246 Board Chairs responding. The full BoardSource report can be downloaded here. Chief executives aren't satisfied: only 1-in-5 strongly agree that they have the right board members. Diversity is still an issue: a full 25% of boards remain exclusively White. Board meeting attendance is waning: The number of boards with 90% to 100% attendance declined from 41% in 2012, to 37% in 2014. Financial oversight scores high marks: 86% of chief executives and 93% of chairs agree that their boards have sufficient financial expertise. Revision is rampant: 85% of boards have revised their bylaws within the past 5 years. Fundraising efforts are underwhelming: Both chief executives and board chairs gave “C’s” to the fundraising efforts of their board. Board diversity is increasing but gaps persist: Racial, ethnic, gender and age diversity among chief executives and board members is increasing slowly. The good news is that 50% of respondents said that their organizations “have policies and practices in place that are designed to increase the inclusion from diverse and marginalised communities.” That number is up from 38% in 2012. So, how would your board score? Boards play a crucial role in leading and in some cases, even managing associations, non-profits and clubs. So it’s imperative that these teams function effectively. How do you think your board would score? The Leading With Intent survey asks some important questions about boards. If you want to see how your board matches up to the “industry standards” and perhaps find some areas of improvement – check out the BoardSource report here. Want more help with your board? Stagnated board meetings? We recently asked your peers in our Small Membership Advisory Community to weigh in. They came up with 7 Surprisingly Simple Ways To Improve Board Meetings. Image source: Both images were taken from “Leading With Intent: A National Index of Nonprofit Board Practices”.